Expect luxurious , elegant and auspicious items on your table with smiles drawn on everyone's faces this Lunar New Year with delicious feasts and festive treats at TROVE Johor Bahru! To welcome the prosperous new year, toss higher with our variety of Salmon Yee Sang with Caviar and indulge in the hot and healthy Double Boiled Fish Soup with Ginseng and Snow Pear. Pamper your cravings with an array of main courses from Steamed Red Snapper Nyonya Style or Steamed Live Tiger Grouper Hong Kong Style , Braised Abalone with Black Mushroom and Broccoli, Ying Yang Crispy Chicken and prawns cooked in a choice of 3 signature styles ; Crispy Butter with Oatmeal, Pan Fried with Garlic and Salted Egg or Three Style Pan Fried. You will definitely love our Yang Zhou Fried Rice and Treasure Glutinous Rice in Lotus Leaf and end your meal with our Chilled Longan with Snow Fungus, Ginko , Red Date and Peach Gum or Chilled Longan with Sea Coconut. Yang Zhou Fried Rice and Treasure Glutinous Rice in Lotus Leaf. It taste soo good! I like the taste of dried shrimp inside the glutinous rice. 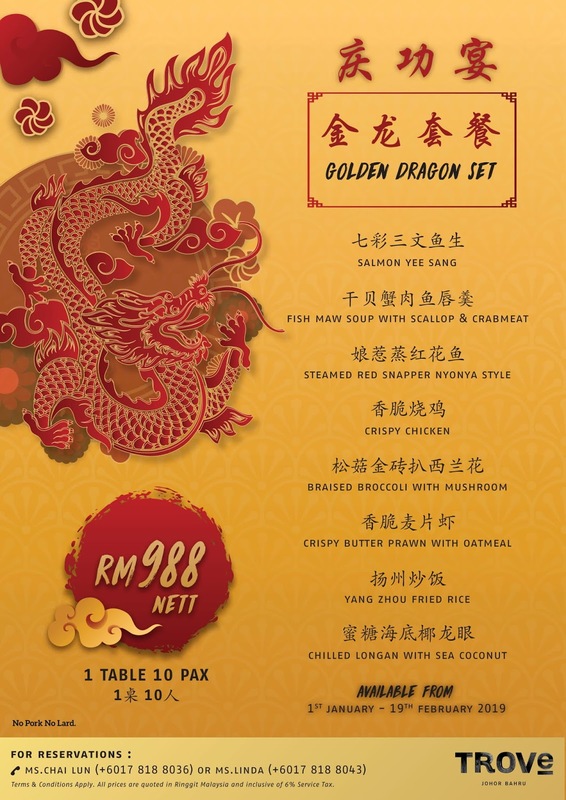 Golden Dragon Set is priced at RM988 nett and Crimson Phoenix Set is at RM1188nett per table for 10 persons respectively. An abundance of prosperity awaits you with our Auspicious Set at RM828 nett per table of 6 person and RM1388 nett per table for 10 persons. 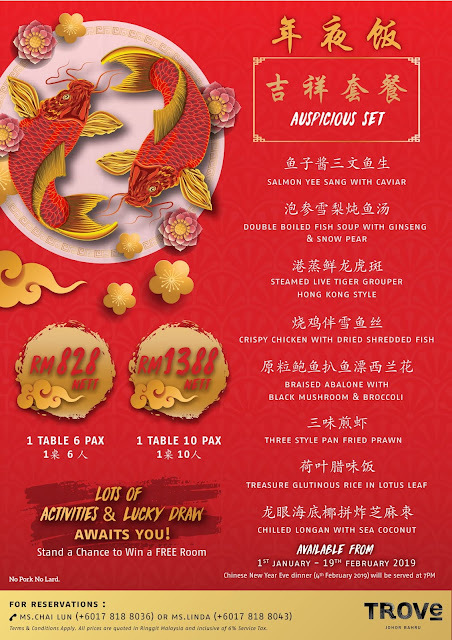 There's more when you dine with us on Chinese New Year eve with Auspicious Set, don't lose the opportunity for a lucky draw and stand a chance to win a free room stay! 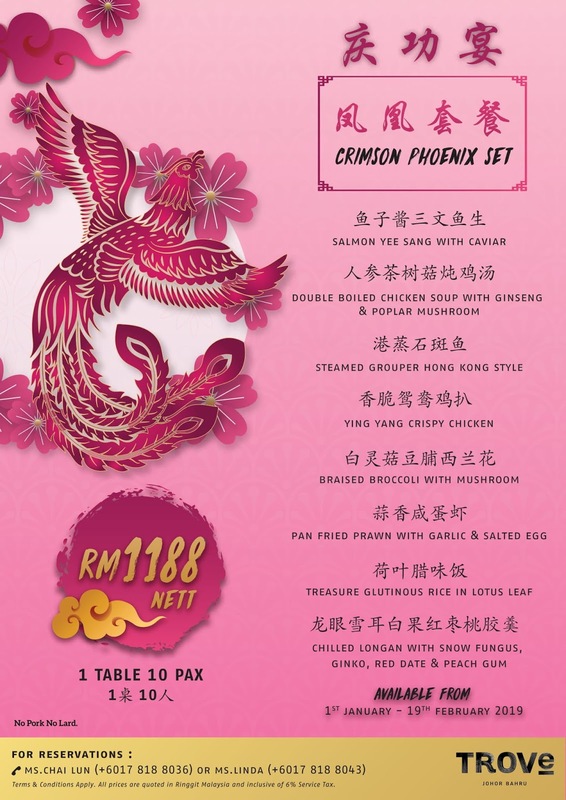 All Chinese New Year Celebration packages are available from 1st to 19th February 2019. Advanced reservation is recommended at least three days in advance. Hurry and book your tables for a cosy catch up session over the festive period with family and friends by contacting Ms. Chai Lun at +60178188036 or Ms. Linda at +60178188043 . Alternatively , you can log onto www.careluxuryhotels.com/trove-johorbahru/offers/dine for more information. 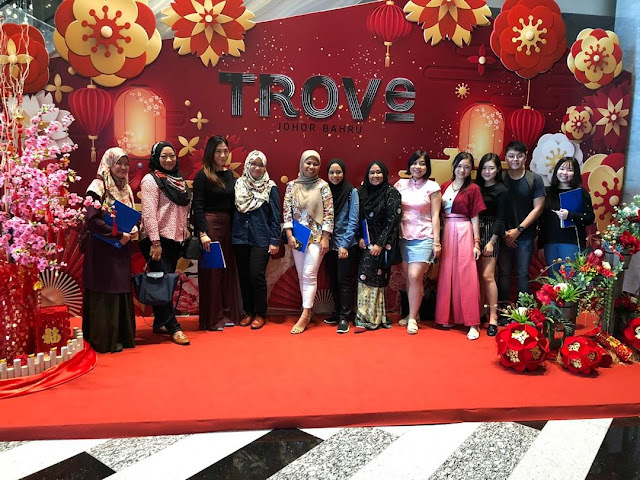 Bloggers and Media Invitation at Trove Hotel Johor Bahru! Ikan tu gosok tak gigi dia? Bikin ngiler liat makanannya, it's so delicious!